Ranakpur, India submitted to the assignment ‘Sacred Landscapes’ on National Geographic. Kristian Bertel has contributed to the National Geographic Your Shot photo community with an assignment called ‘Sacred Landscapes‘. The idea of sacred landscapes came to the curating National Geographic Explorer Fabio Esteban Amador with his interest in ancient cities and the many such sites around the world. This was truly an exciting time as a young archaeologist. Looking back, however, he realized that today’s cultural centers are the modern expressions of their ancient counterparts and so are a progression in our very complex worldview. One thing for sure is that we are all bound by history to ancient peoples, who often leave behind remnants of the world. Structures, buildings, art, fountains, temples, villages, caves, roads all these are physical manifestations that link the future, the present and the past. Just as these structures lay dormant underneath our modern landscapes, he wondered if it was possible to capture images that could take us to another era, a time when the world first became modified by the belief that the Earth’s surface was indeed a physical representation of our myths and heavenly bodies, a map of the universe. As an archaeologist, he is drawn to ancient societies and how different people in different regions have expressed their beliefs in countless ways. As a visual explorer, he has become fascinated with the idea of capturing images that reflect the notion of timelessness. He has found that the junction between the accidental geography and society are uniquely expressed in countless and significant ways. He sees these sacred landscapes as brilliant combinations of natural elements and human vision and action, proportion, color, depth and light, a continuum. 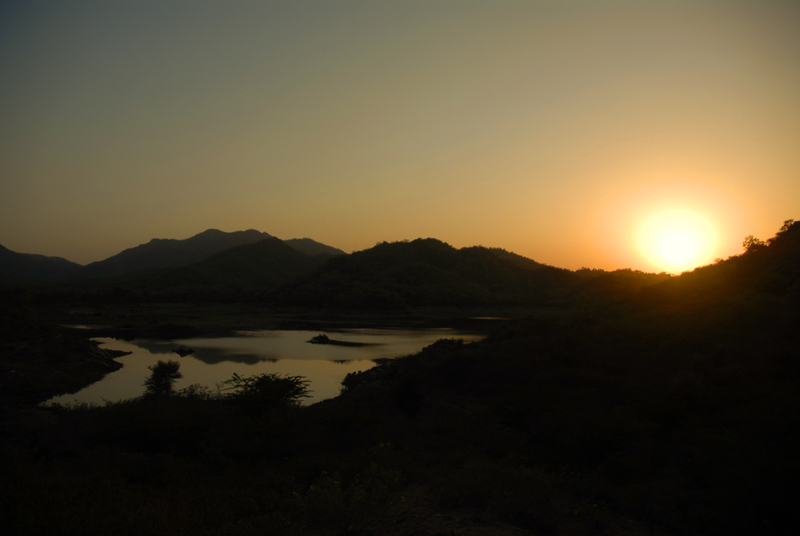 Landscape photography shows spaces within the world like in the photo taken near Ranakpur in Rajasthan, India. Landscapes like this can sometimes be vast and unending, but other times microscopic. Landscape photographs typically capture the presence of nature but can also focus on man-made features or disturbances of landscapes. Landscape photography is done for a variety of reasons. Perhaps the most common is to recall a personal observation or experience while in the outdoors, especially when traveling. Others pursue it particularly as an outdoor lifestyle, to be involved with nature and the elements, some as an escape from the artificial world. Landscape photography is typically of relatively stationary subjects arguably a form of still life. This tends to simplify the task, as opposed to photography of kinetic or live subjects. However, landscape photography often overlaps the activity of wildlife photography, and the two terms are used somewhat interchangeably, as both wildlife and landscapes may be elements of the same picture. ”– For wide open spaces, a wide-angle lens is generally the preferred lens for me, allowing a broad angle of view. However, medium-range to telephoto lenses can achieve satisfying imagery, as well, and can enable the capture of detailed scenery of smaller areas at greater distances. Telephoto lenses can also facilitate limited ranges of focus, to enable me as a photographer to emphasize a specific area, at a fairly specific distance, in sharp focus, with the foreground and background blurred. And in this picture of the sun going down, the soft light on the hills made a beautiful form of still life in the landcape”, the photographer Kristian Bertel says.